Right after Julian Assange was arrested by the U.K. secret police at the Ecuadorian embassy in London which was his refuge for almost 7 years, the corrupted media in the U.S. joyfully gloated about this arrest. Their message to the American people was that the Assange saga is over, end of story! The U.S. Attorney’s Office for the Eastern District of Virginia issued a press release and charged the founder of WikiLeaks with “conspiracy to commit computer intrusion for agreeing to break a password to a classified U.S. government computer”. 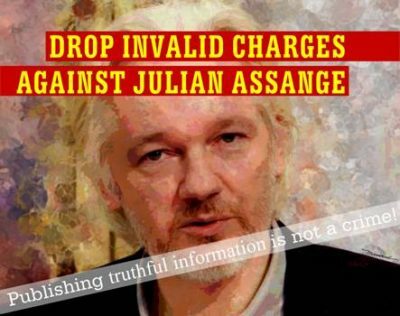 They were expecting to see Julian Assange in the American courtroom immediately “pursuant to the U.S./UK Extradition Treaty”. It seemed that the plan against Julian Assange which was plotted by the U.S., U.K. and new regime in Ecuador is going forward accordingly. That was April 11, 2019. However 24 hours later, the reality on the ground looked more complex than a phony charge on a piece of paper! Even the New York Times –mother of all fake news — had to admit that: “Extraditing Assange Promises to Be a Long, Difficult Process”. Indeed, there are many obstacles for the American authorities to extradite and convict Mr. Assange. According to BBC, “Labour leader Jeremy Corbyn said Assange should not be extradited ‘for exposing evidence of atrocities in Iraq and Afghanistan’”. “the UK had now arbitrarily-detained the controversial anti-secrecy journalist and campaigner, possibly endangering his life”. Free Julian Assange and Chelsea Manning NOW!